I had a full day to myself in Buenos Aires, my favorite place in the entire world—an accolade I don’t take lightly. And, having grown up in the city and visited many a time, I had a nice little itinerary planned for how I would spend my day. Expectedly, my day would begin with brunch, followed by quite a bit of shopping, punctuated by a few visits to multiple coffee shops to gorge myself on espresso and alfajores. I would then make my way back to our stunning Belle Arts hotel, the Sofitel for a visit to the spa and some time spend in the bibliotheque inspired wine bar for some Malbec. Sometimes you need a “you” day and boy-oh-boy was I thrilled about mine. 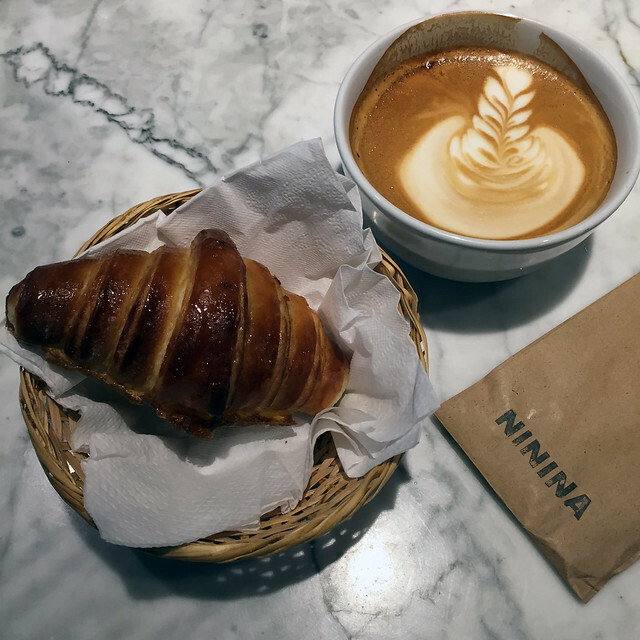 I knew exactly where I was going to begin my day: Ninina, a sleek, stunning bakery and café in Palermo, the neighborhood known for its chic boutiques, posh patrons, and cool cafés. Ninina had been recommended by multiple travel blogs and I’d of course stalked the Instagram—this place is definitely Instagram worthy. The restaurant is absolutely pristine—and would fit in perfectly in lower Manhattan or Brooklyn. 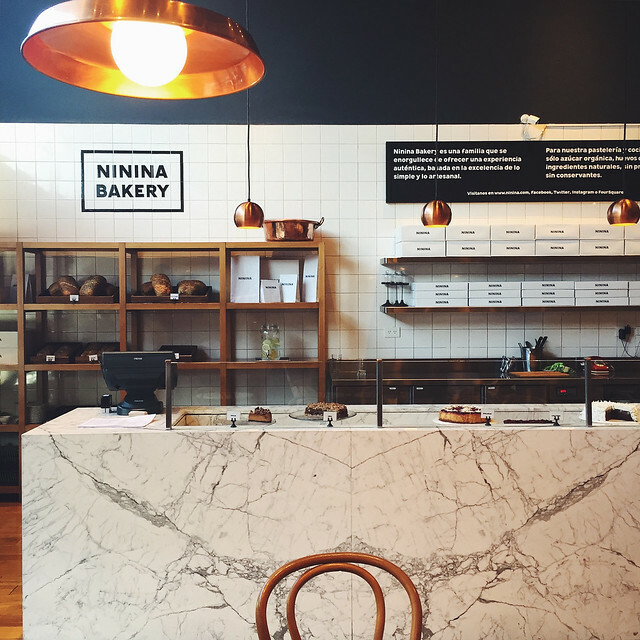 The space is sleek, with a long Carrera marble bakery counter, accented by white subway tile backsplash, black-and-white branding, and gorgeous, sleek copper light fixtures hanging from the ceiling. The narrow, rectangular restaurant has light oak seating, with long rectangular tables and Thonet chairs to match. It’s clean, sleek, and jaw-droppingly beautiful. I would love to call this architect and have him design my dream kitchen one day. On this particular week day afternoon, the space was filled with beautiful Argentines of all ages, from older ladies who lunch to University students meeting or catching up on work. Slightly intimidated by all the pretty, I made my way to a seat at the bar in front of the open kitchen by myself. Every single pastry looked absolutely decadent, from classic croissants to tartes and galletes and Argentine classics like alfajores. The loaves of bread also looked pristine. I began my meal in the classic style, with a croissant and a cappuccino. Both were incredible—God bless Argentina and its café culture. 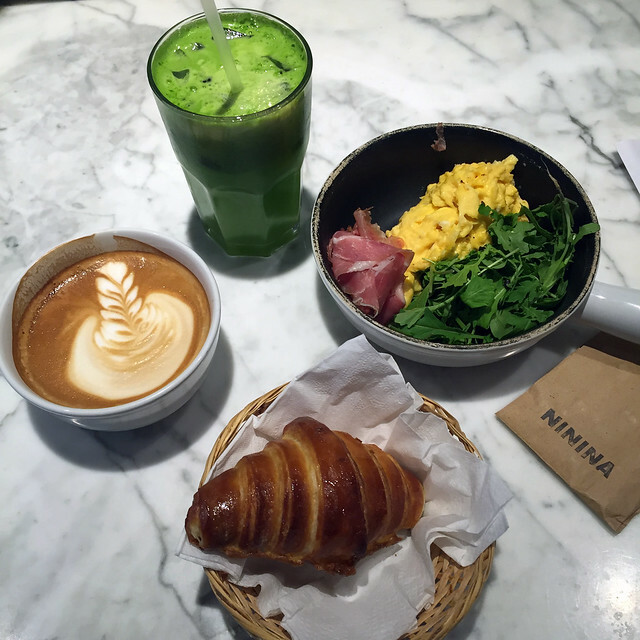 I appreciate that many of the cafes offer both classic coffee shop fare, like croissants, pastries, and coffees, as well as healthy options like green juices and salads. We’ve seen a lot more healthy restaurants added to the mix in Buenos Aires over the last decade, so it’s not just cafés, heladerias, and parillas. 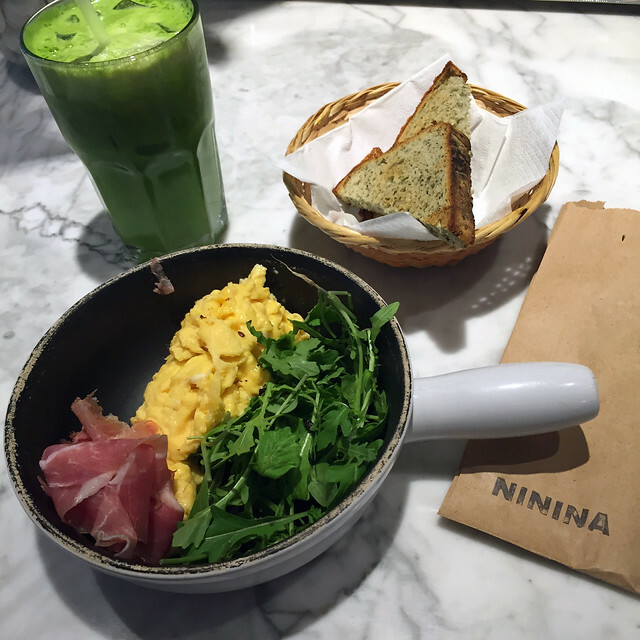 I ordered a simple scrambled egg dish, served with proscuitto and arugula that was clean, fresh, and well-executed. And, a green juice—with kale, pineapple, and spinach, served over ice. It was delightful. If you’re planning a trip to Buenos Aires and love brunch—and I presume you do—Ninina, and Olsen (read that review here) should the top two spots on your to-brunch list.